I’m a huge paper nerd. I love books, planners, stationary – you name it. I get even more excited about colored pens, pencils, and highlighters. So I was pretty amped when I first saw some examples of Bible journaling online. 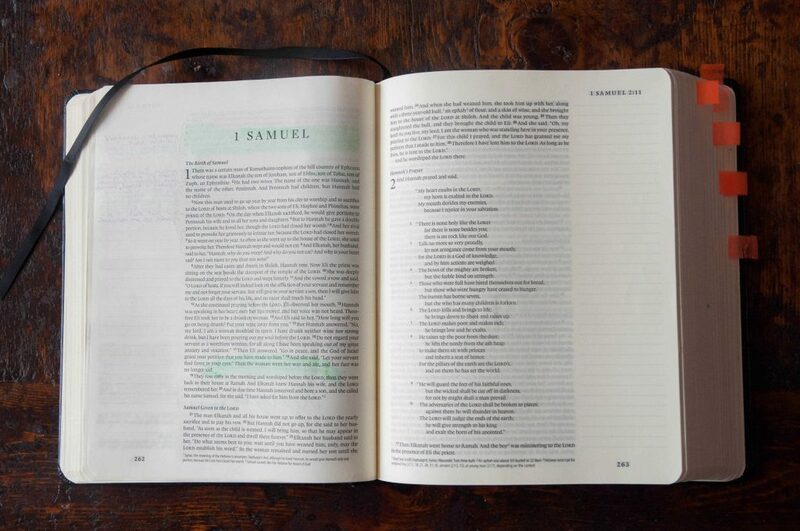 Bible journaling is a form of Bible study where people draw, write, and make art in the margins of their Bibles. I am no artist, and I am quite liberal when it comes to my religious beliefs. Still, I really enjoy Bible study for both its academic and personal merits, and I was excited to get to work. Some people use their journaling Bibles for “devotional art,” which is often incredibly beautiful. I like to use my margins for notes and commentary, with occasional doodles. 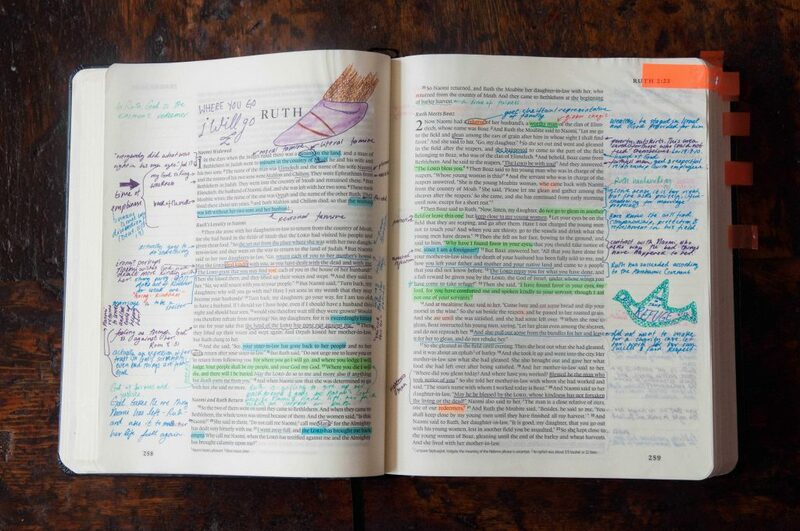 To some, doodling and note-taking in a Bible may sound sacrilegious. However, I find that it’s a great way to process what I’m reading and commit the core text to memory. 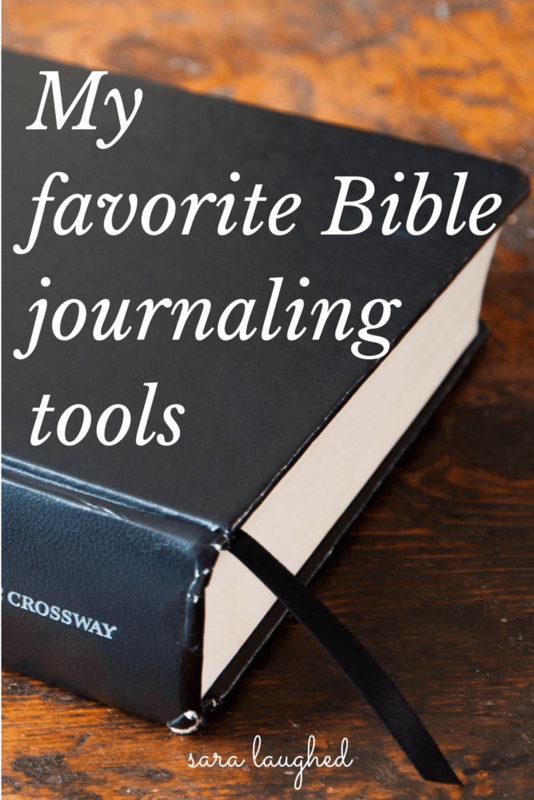 Today I’m going to show you some of my favorite tools for Bible journaling. These are just the most basic supplies – though many people use paints, colored pencils, and other tools, all you really need is a pen and paper, and possibly a few highlighters. Those favorites are what I’ll be sharing today. Notes on a recent study of Ruth. Here you can see an example of both my doodling and note-taking. I have taken notes in several Bibles over the years, including an enormous NRSV and a pocket version of the Message. This Bible is by far the best for note-taking and journaling of all I have tried. I love that it opens flat to any page, from Genesis 1 to the end of Revelation. I like the cream color of the pages and the single-column format, which makes reading and underlining easier. I also appreciate the fact that it is relatively compact and includes an elastic strap. The one I have, above, reminds me of a Moleskine notebook, and it wouldn’t surprise me if this were an intentional part of the design. You can read more about the design and details of this Bible over at the excellent Bible Design Blog, where the author reviews a red-covered version of this same Bible. If black or red isn’t your thing, Crossway is also coming out in September with a beautiful Cloth Floral and Antique Floral Design with the same margins and cream-colored paper. I’ve written about pens before on this blog, so you may be wondering what makes these any different. Having used gel pens, rollerballs, and even my beloved Stabilo pens on Bible paper, I can say that bleed-through is a huge problem. It’s frustrating, ugly, and it makes the other side of the paper harder to read. 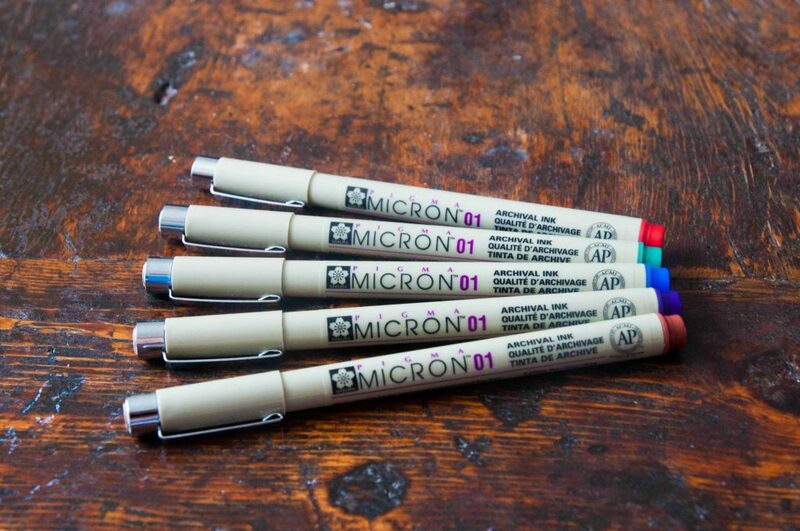 Pigma Micron pens are designed for archival paper, so the ink does not bleed through, even on very thin paper like that found in most Bibles. The tips are very fine, so it is easy to take small notes in the margins, or make bigger doodles. Some word art from Hosea, inspired by a visual made by the popular Bible study company She Reads Truth. There is a small amount of what pen enthusiasts call “ghosting,” which is when you can see the shadow of text on the back of the page. 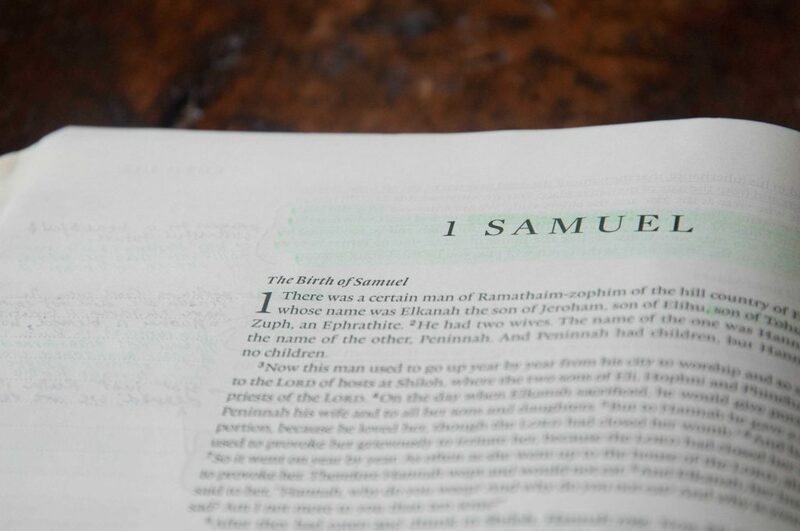 Below you can see a small amount of ghosting from my Ruth study on the first page of 1 Samuel. Some light ghosting from the Pigma Micron pens – still less than any I have tried. Both the above Bible pens and these highlighters were recommended to me on another blog by Bible study enthusiast J. A. Medders, so credit goes to him for these great finds! This highligher is very gentle on the pages of my Bible, and again, has limited ghosting. 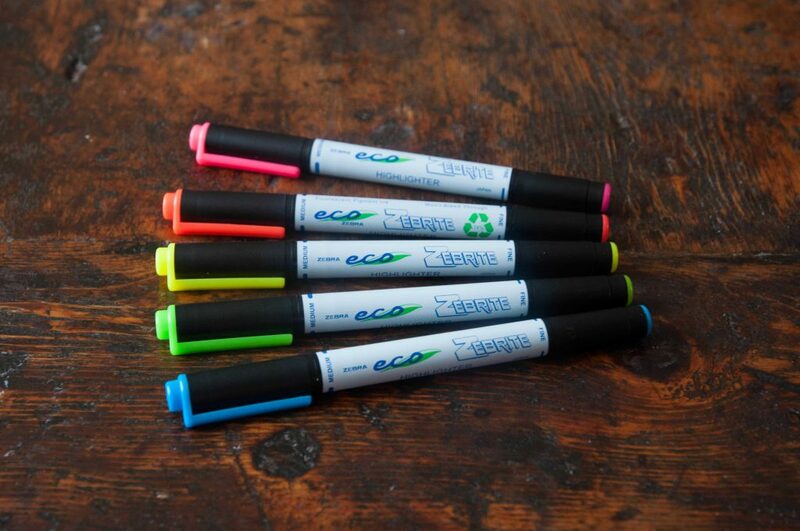 A small amount of ghosting from the highlighters and pens can be seen below, on the left-hand page. Again, this is less than I have had with any other pens or highlighters, which I find often bleed through. I use these highlighters for color-coding also, with the different meanings depending on which book I’m studying and what motifs it makes use of. For example, the Book of Ruth contains a lot of fullness and emptiness imagery, so I used green and blue for those, respectively, and orange for etymology. I can’t speak highly enough of these three products, which I use together whenever I do academic or personal Bible study. Though I don’t do devotional art, if you are curious there are some beautiful examples by others on my Pinterest board for Bible journaling. Give it a look! What do you think of Bible journaling? Is it something you would ever try? I hope to hear from you in the comments below! You are making me want to invest in these pens and highlighters! Maybe even the bible too, since mine has such little space for notetaking, haha. I love to write in my bible 🙂 but as of now, I just use a regular pen. I’m so glad, Gina! Good luck to you! 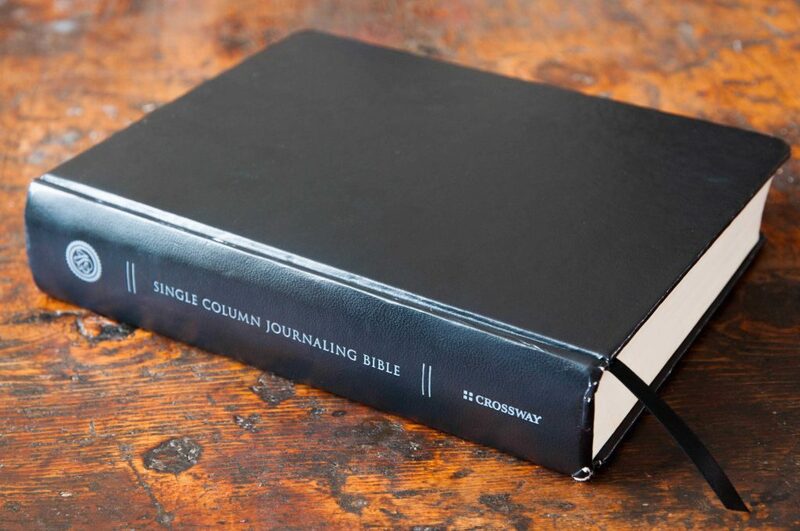 I had never heard about Bible journaling before, but I definitely want to try it. I love looking at your Bible journaling examples, Sara. 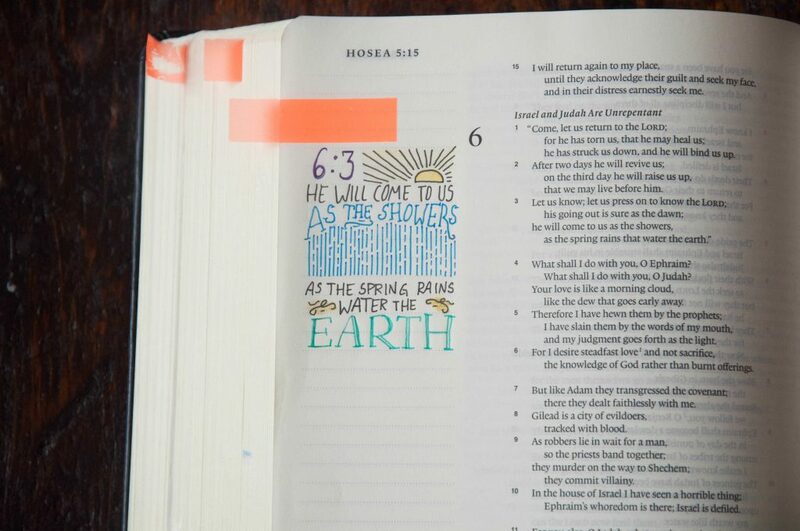 I especially enjoy your example about how He will come to us as the showers, as the spring rains watering the earth. So beautiful! I am very new to Bible journaling and don’t want to invest in a lot of expensive art products. Thank you for this helpful post. I’m looking for products and am interested in more of the gel highlighters like one demo one I got free. The benefit is no bleed through, and a great foundation for pens for highlighting key words over them. It seems to keep that layer from bleeding through as well, at least Day 1. I just bought this bible and the pens through your link, since I was planning on buying them anyway I’m glad I could support you in the process! Thank you so much and I’m SUPER excited to start sharing my journey as well, thank you for being a continuing inspiration! Thank you so much, Karin! I am so excited for you to start journaling! I want to start Bible Journaling but i want my Bible Jouranl in spanish any suggestions where to buy one in spanish? Help please i would deeply apreciate it! Are the lines in the bible you use to journal in faded enough? Do they distract from the picture at the end? Have you ever tried dry highlighters before? They are my favorite because they do not bleed through, but highlight really well. I also sometimes just use colored pencils as they work well too! Oh my goodness! I have found this so helpful! Not only are they pretty cheap but I used children colored pencils and let’s just say it was a disaster! I would also like to know how to connect the story and tips to dig deeper.